204 pages | 9 B/W Illus. 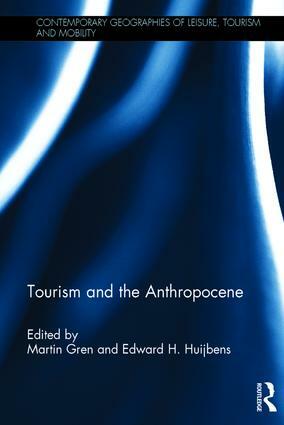 This book brings the field of tourism into dialogue with what is captured under the varied notions of the Anthropocene. It explores issues and challenges which the Anthropocene may pose for tourism, and it offers significant insights into how it might reframe conceptual and empirical undertakings in tourism research. Furthermore, through the lens of the Anthropocene this book also spurs thinking of the role of tourism in relation to sustainable development, planetary boundaries, ethics (and what is framed as geo-ethics) and refocused tourism theory to make sense of tourism’s earthly entanglements and thinking tourism beyond Nature-Society. The multidisciplinary nature of the material will appeal to a broad academic audience, such as those working in tourism, geography, anthropology and sociology. Martin Gren is Associate Professor in Tourism Studies at Linnaeus University, Sweden. Edward H. Huijbens is a Research Professor at the Icelandic Tourism Research Centre, based at the University of Akureyri, Iceland.